Private shuttle NOT shared. Pricing is per group not per person. One Way $100. $115. $120. $210. $235. Round Trip $200. $230. $240. $420. $470. Round Trip $140. $160. $170. $290. $420. One Way $180. $205. $250. $290. $430. Round Trip $360. $410. $500. $580. $860. Port of Miami Transportation Shuttle service from Miami International Airport to Port of Miami Transportation and Fort Lauderdale Airport (FLL) to Port of Miami Transportation. 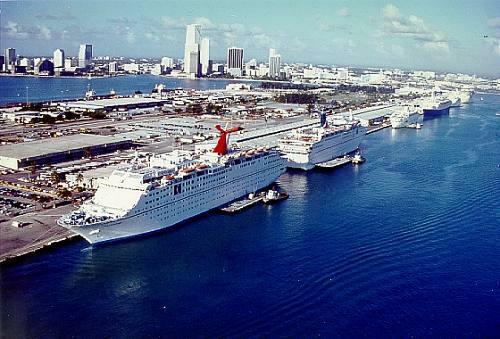 Cruise Port Transfers to or from Fort Lauderdale, Miami and West Palm Beach. Prices are valid to or from the Miami Port. FLL Airport Shuttle and Port of Miami shuttle service. We specialize in shuttles to and from cruise ports. If you are looking for hassle free prearranged transportation to or from Miami Airport ( MIA ), then you've come to the right place! The Florida Sunshine Shuttle offers private transportation from Airports, Seaports, Hotels, Theme Parks, and Private Homes (Door to Door). This is not a " Shared Shuttle " so you won't have to waste time by making several stops until you reach your destination. We do Not charge a baggage handling fee. The rates are total prices and includes 10% Driver Gratuity. By Law Advanced Reservations are Required! A $10.00 or 10% surcharge whichever is greater will be added to all reservations made within 5 days of travel. A $30.00 or 10% surcharge whichever is greater will be added to reservations made within 1 day of travel. A $50.00 Meet & Greet charge per transfer will be added to all reservations placed without a contact U.S. or Canadian cell phone number. The charge is nonrefundable for any reason once charged. Pricing is all inclusive, when comparing prices please do the math and double check that bargain -- it may turn out not to be such a bargain after all! Do you already have your cruise booked and need information about your particular cruise line of what to do before or after your cruise. We've included links below for the most popular cruise lines sailing out of Florida. This is includes what to bring as well when you should arrive at the port with your shuttle to the Miami cruise port. Florida Sunshine Shuttle offers Port of Miami Transfers for; Carnival Cruise Shuttle Transfers, Royal Caribbean Crusie Transfers, Norwegian ( NCL ) Cruise Line Transfers, Disney Cruise LIne Transfers. We offer shuttle transfers for all cruise lines sailing in or out of the Port of Miami and service all South Florida Airports and Hotels. We have transfers for Ft. Lauderdale Airport and West Palm Beach Airport to or from the Port of Miami. Yes, car seats are available upon request and they are not guaranteed. You may make a request for 1 car seat only and must be done at the time of booking. If you absolutely must have one we encourage you to bring your own. We have car seats only, we do not carry infant seats or boosters.